Without goals, it's easy to lack focus and direction to move our careers and lives into the future. But to accomplish goals, we need to know how to set them. Goal-setting is a process that starts with careful consideration of what you want to achieve and ends after a lot of hard work. ResourcefulManager's "Goal-Setting That Works" Blueprint comes with an unconditional, 100% money back guarantee. 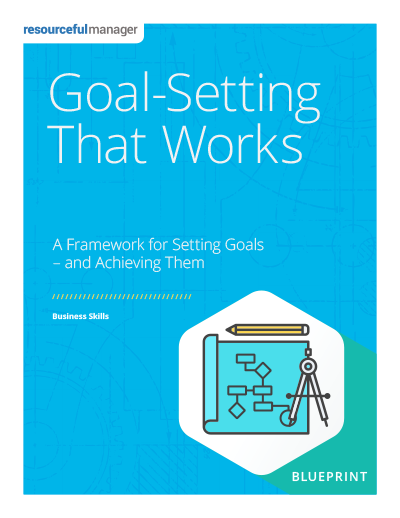 We're confident you'll find several new and useful ideas to help you navigate the goal-setting process, presented in a practical, easy-to-implement format. If you decide "Goal-Setting" Blueprint doesn't deliver value or simply isn't your cup of tea, just email us at contact@resourcefulmanager.com within 90 days, and we'll process your complete, no-hassle refund in 1 business day or less.